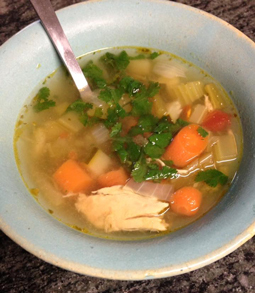 Salsa Verde Chicken Soup - A recipe from Savor California, the online showcase for extraordinary gourmet foods and beverages from California. In a crockpot cook the chicken, the container of Salsa Verde, the half onion chopped and the jalapeño. Cook on low all day or night. Shred the chicken with 2 forks when done. The next day, sauté until soft the other half onion, carrots, zucchini, and celery. Add the chicken broth, Ortega chilies, tomato, and the Salsa Verde Chicken. Top with cilantro and a squeeze of fresh lime. Also enjoy the chicken in burritos, tacos or quesadillas.